Assuming your doc gives you the green light, there’s no need to stop training and eating clean, healthy food when you’re pregnant. Here’s how. Interest in the topic of weight gain during pregnancy has ballooned. On a recent pregnancy blog, I noticed many women supporting each other in their unhealthy cravings and overindulgences. "If you are worried about your weight then, really, what kind of mother would you be?" "If you're craving something when you are pregnant, you should eat it because the baby wants it!" "It's the only time in a woman's life where weight gain is acceptable; you can wear elastic clothes while you grow!" As a personal trainer and fitness nutritionist, and as a woman who has very recently had a baby, this type of mentality saddens me. Throughout my pregnancy, I was eyed skeptically while I worked out. I heard, "Don't you need to put on some weight?" and, "Aren't you over doing it?" I had to bring the woman who bore me to one of my doctor's appointments so she could hear for herself that my training and my healthy eating habits were not hurting her grandchild in the womb. Because I took such good care of my body, my journey through pregnancy was a breeze. I dodged symptoms that normally plague overweight and sedentary women. I sit here today, a week after giving birth, in my skinny jeans. I have six weeks of rest ahead of me, but I'm at peace with it because I feel phenomenal! There is little in the way of direction for pregnant women looking to stay fit. Most articles just throw in pictures of pregnant ladies holding a 5-pound dumbbell or smiling in yoga pants. There's a lot more to staying fit during pregnancy than just buying a mat a doing some stretches. I'd like to share my knowledge and experience to help pregnant women stay fit and healthy-you AND your baby will be better off with diet and exercise. We should approach these nine months of carrying another human being with more care and attention than we would at any other time! If you would like to remain or begin working out during pregnancy, begin in the practitioner's office. Find out first what you are allowed to do. The most common restriction is keeping your heart rate down. My doctor told me to keep my heart rate below 140; that was problematic for me because I had to totally tone down my normal cardio routine. My running turned into trotting and became painfully boring. Grab dumbbells that you would normally use for a 12-15 rep range and use them for an 8-10 rep set. You're still lifting hard, but not getting your heart rate up too high for too long. After the first trimester, stay away from lying flat on your back whether you are doing abs or bench press. The uterus could potentially compress the vena cava, which may result in a reduced blood flow, leaving you dizzy or nauseated. Sometime during your pregnancy, Relaxin, a hormone that loosens ligaments to prepare your body for delivery, will kick in like a feisty fetus. When you feel it, back off your heavier or more difficult free-weight movements and drift more to the machines for more support and safety. Take your jogging cardio to the elliptical to prevent hip or knee pain. Listen to your body. Adjust your workout accordingly. It's a fact of creating new life: While you're pregnant, you're going to gain weight. Here's Why: on average, women gain 7.5 pounds for the baby, 1.5 pounds for the placenta, 2 pounds for the amniotic fluid, 2 pounds for uterine enlargement, 2 pounds for breast tissue, 2 pounds for blood volume, 4 pounds of fluid in maternal tissue, and 7 pounds of maternal fat stores for an average total of 30 pounds. To stay within that range, you're going to have to use some will-power and restriction. There's no need to satisfy every craving. If that were true, I would have spent my entire pregnancy eating Mexican food and frozen yogurt. Pregnancy does crazy things to your blood sugar, and it's your job to keep it regulated with healthy, clean foods, not Twinkies. Keep your metabolism revved by eating every 2.5-3 hours. Take advantage of the thermogenic effect, meaning the energy you expend digesting food. Though protein powder labels may suggest not using protein while pregnant, my doctor said it hasn't been studied or tested thoroughly. I found that protein shakes were my best friend! They helped me through some first trimester morning sickness and supplemented my lifting with good calories and lean protein. The National Women's Center of Health recommends eating an extra 300 calories during the last 6 months of pregnancy. Don't add empty calories! Three hundred calories is a half cup of oatmeal and one scoop of protein powder, not an extra cheeseburger. While a clean, healthy diet is important, it's unhealthy to be on a calorie-deficit diet during pregnancy. I'm a 5'9" figure competitor, and my clean eating plan comprised 2,000 calories per day: 185 carb grams, 170 protein grams and 62 essential fats grams. That might seem like a lot of food, but I was training and eating about 85% clean. Maintaining a good diet keeps your blood sugar from dropping and your waistline from getting bigger than it must. This will also put you on the right track for weight loss after your baby arrives. The healthier you are, the healthier your baby will be. 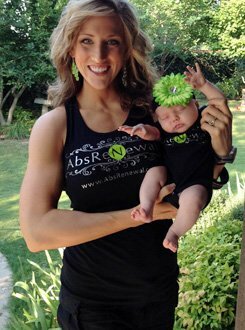 My clean diet and exercise program helped me produce a 7-pound, 5-ounce baby. The chubby cheeks and rolls look amazing where they belong, on him, but not on the post-pregnancy mom! www.absrenewal.com or see AbsRenewal on Facebook.